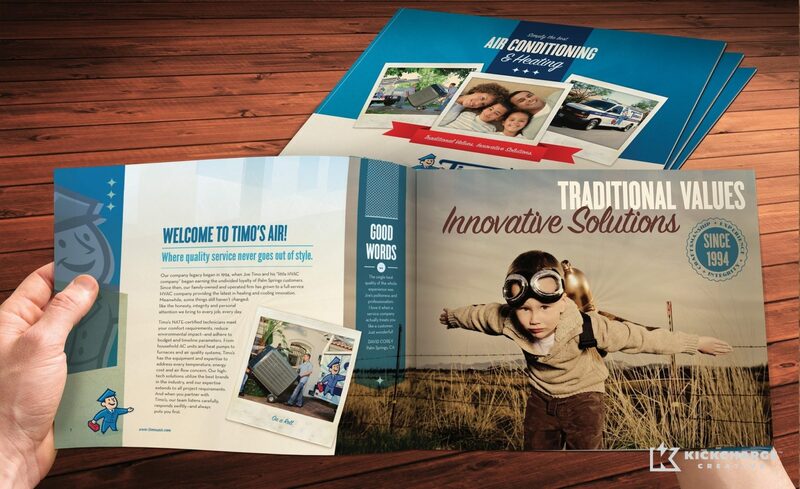 When Palm Springs, CA-based Timo’s Air Conditioning & Heating decided to elevate its business image, the company partnered with KickCharge® Creative to create the perfect match to take an already reputable brand to even greater heights. Having built the family-owned business on unparalleled customer support, fair pricing and craftsmanship, it was time to partner with a marketing firm to grow the business further. What the company didn’t realize is that the choice to rebrand the company with KickCharge Creative would help triple the business within four years. 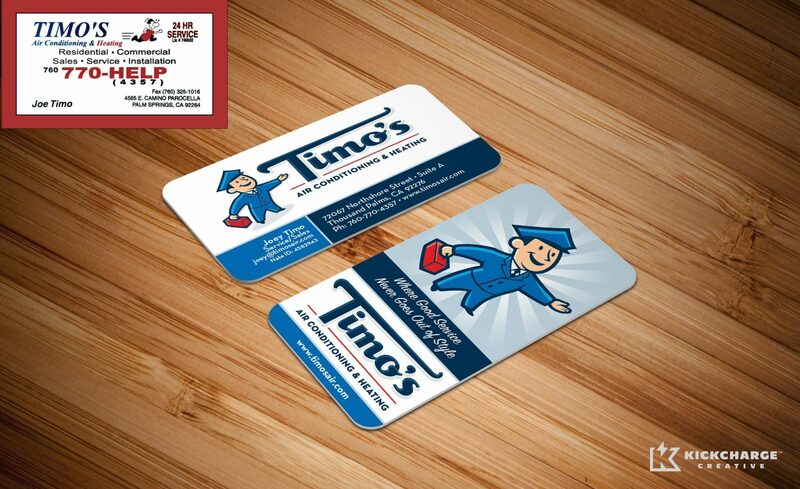 When we partnered with Timo’s Air Conditioning & Heating, we thoroughly discussed the direction and focus for its branding. As a result, our team decided to highlight their history with a retro-themed brand that communicated the quality customer service that’s often missing from today’s service companies. Following extensive research, a hand-drawn logo was created, as well as typography—all to reflect a design style indicative of the mid-1950s. Playing off the branding, we developed the company’s stationery, along with the most important branding asset—the fleet of vehicles. 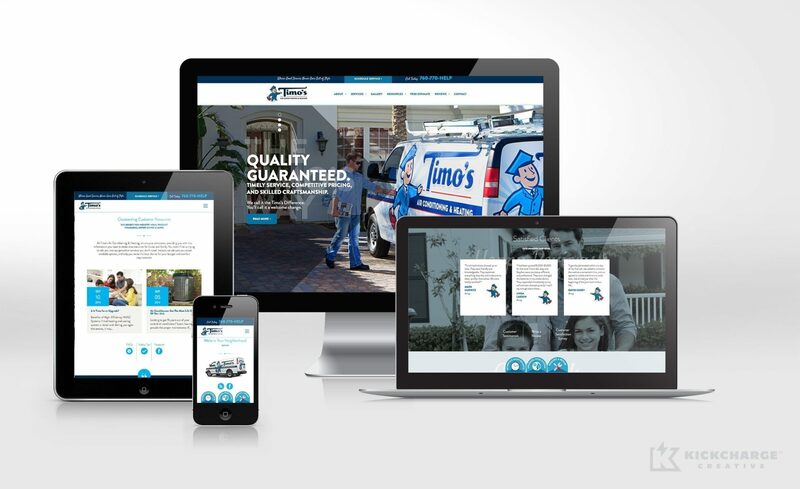 A unique design was created for its service vehicles, which has proven to be a source of renewed brand recognition and quality leads. Next was the website design, which effectively carries the retro theme. We like to think that if the Internet had been around in the 1950s, this is what web sites would look like. A very aggressive search engine marketing strategy was built into the site, and it serves as a great generator of qualified leads, as well. Helping a small business elevate its branding to reflect its high quality service is a rewarding experience for us at KickCharge. 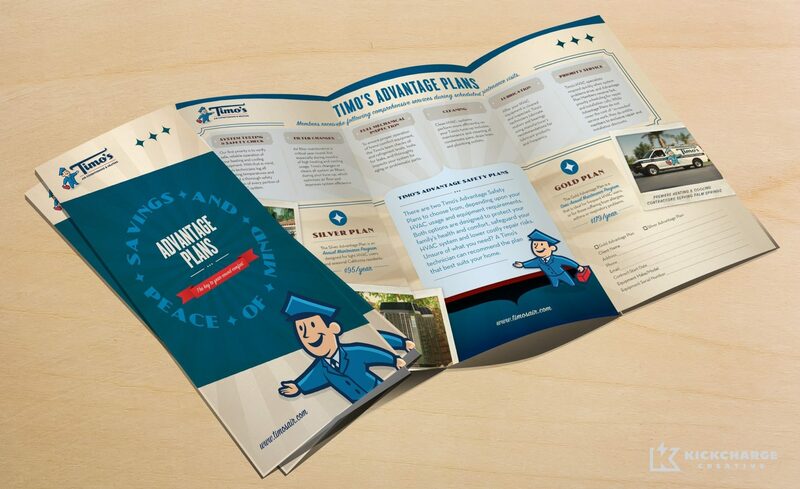 When our clients succeed—so do we. 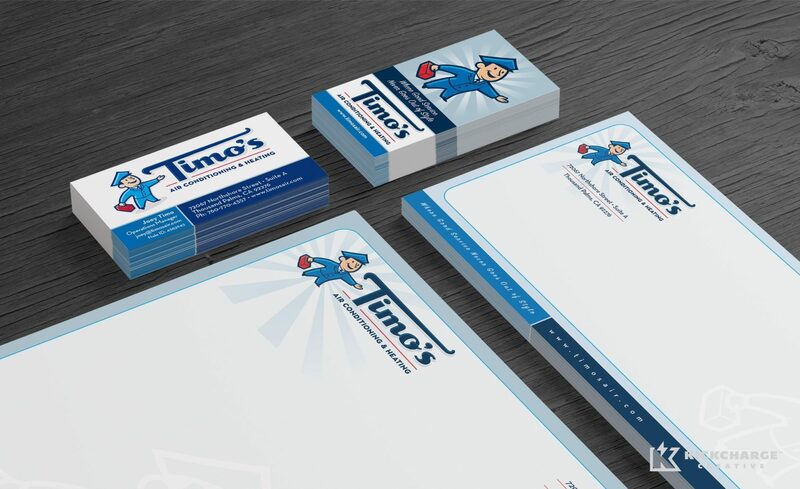 Within one year of implementing newly branded sales tools, Timo’s annual service agreement sales increased over 500% and its close ratio increased by 40%. 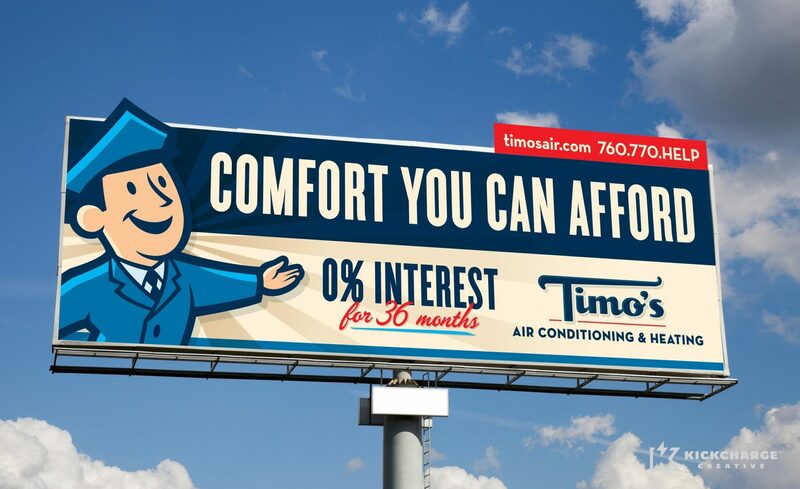 Amongst all of the rebranding efforts for Timo’s Air Conditioning & Heating, its sales tripled within just four years. In June of 2012, the vehicle wrap and vehicle advertising that we designed was awarded first place in HVACR Magazine ‘Tops in Trucks’ Contest. Timo’s service vehicle was also featured on the front cover of SignCraft Magazine. After rebranding, the Timo’s team was also interviewed in the September 2012 Issue of HVACR Magazine. Read the interview (and the nice things they had to say about us!). 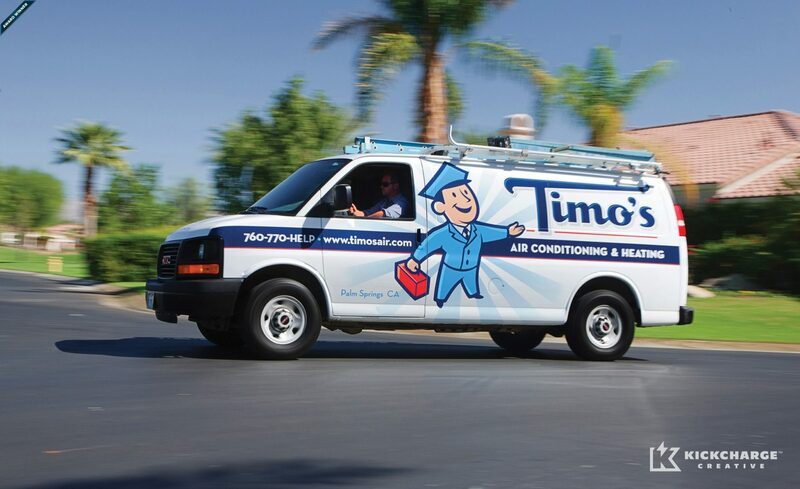 Timo’s award-winning fleet branding was featured on the covers of HVACR Business Magazine and SignCraft Magazine in 2012.